I am admittedly a pack rat. I hate throwing things away that "could" be used for a craft I haven't thought of yet. I also tend to do projects that require tools that will hardly be used for anything outside of that project. Luckily, what keeps me from moving up to the hoarder level is my need for organization. But when you live in a 960 square foot condo with not much storage space this is difficult. With that said, tell me, how is a pack rat, DIYer supposed to store all of her tools without a garage? I'll tell you, that question has perplexed me (and cluttered up my place) for the last 5 years, especially as my tool stockpile has increased. Thankfully, I have finally figured it out. The answer is PEGBOARD! "Pegboard outside of a garage?" Yes. "I've seen some pegboard set ups in kitchens, but let's be honest, they aren't exactly pretty. Do you have a laundry room or something?" Nope. 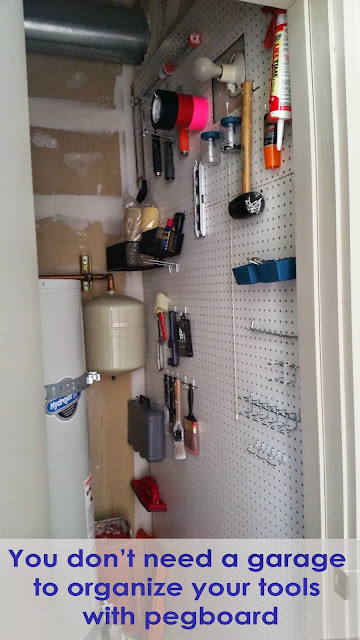 I have more of a laundry closet with very little room for any sort of pegboard. "Then, where on earth are you installing this pegboard for your tools?" Great question! 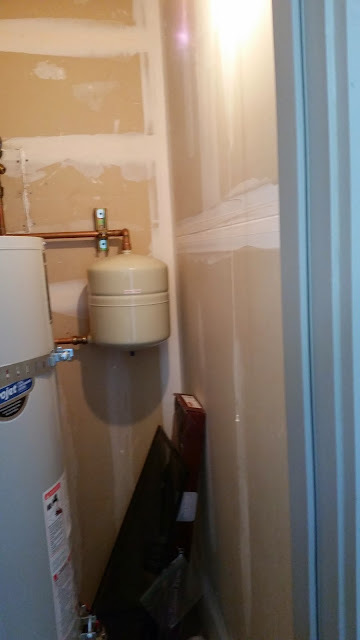 I have a small room off my patio that holds my water heater. And within that room is a bare wall. Perfect for an unseen, tool organizing pegboard. What's sad is that once it was complete I couldn't wait to share my win with anyone and everyone. Am I the only one like that?